People in the Pacific Northwest take wild blackberries for granted. In fact, they’re something of a nuisance, lining highways and filling empty lots (my dad once had to rent a backhoe in order to clear the brambles from a section of our horse pasture after he got sick and tired of trying to use Roundup to no avail.) 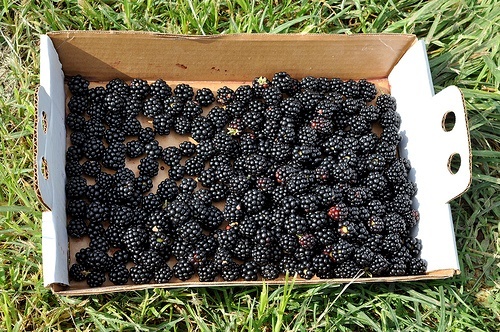 In August, it’s easy to freely pick gallons of blackberries (you may sacrifice a bit of skin in the process – wild blackberries have very sharp thorns) at local parks, nature reserves and backyards. Just make sure to watch where you’re picking, last summer my parents got scolded after accidentally wandering onto someone’s property while picking berries at the very furthest most point of a dead end road. In a large, non-reactive pot (stainless steel or enameled cast iron), combine the sugar and fruit pulp and bring to a simmer. Add cinnamon, nutmeg and lemon zest/juice and stir to combine. Let the mixture reach a boil, stirring frequently to prevent it from boiling over. When the mixture appears to be thickening a bit, bring it back to a roiling boil and add the pectin. Let it boil vigorously for at least five minutes to activate the pectin.